Just a quick post to share a card I did for two separate challenges. The first is Word Art Wednesday and the second is The Color Throwdown. Anytime I can make a card for these two favorite challenges, I get sooooo excited. I had a bit of extra time today, so I was thrilled that I could get a card done. Be sure to check out these great challenge blogs. And there is plenty of time to play along...so give it a try! 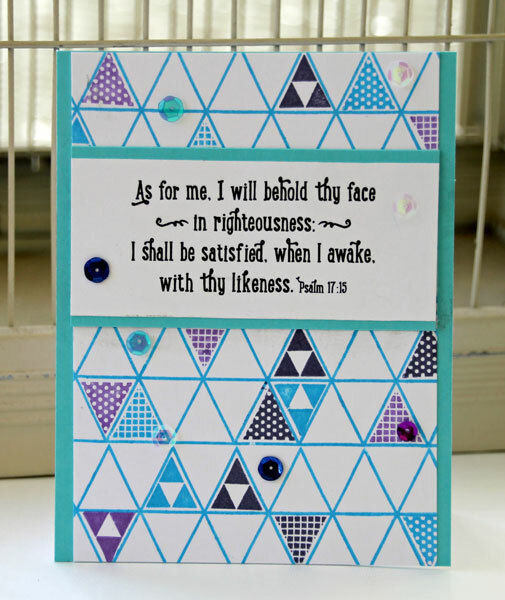 Such a lovely verse and a beautiful card to showcase it! I love this, Susie!! You've just given me an idea and for that I thank you!! Thanks so much for playing the Color Throwdown! What a lovely card, and a HUGE blessing to me! I always greatly enjoy seeing scripture cards, and you have done an amazing job of designing with our word art for this week. Thanks SO MUCH for joining us, and for sharing your talents with us. Your art is such a blessing! What a great quote, and I really love your triangle background! Thanks so much for joining us at the Color Throwdown! You have created such a beautiful triangle background and I love the wonderful quote!!!! Thanks for joining us for the Color Throwdown Challenge!!!!! Love it! The triangle background has an almost quilt feel. Beautiful quote too! What a wonderful card. Love the unique background design and that you were able to incorporate our free Word Art was awesome. We are so blessed with your wonderful project and hope you join us again in this week's Challenge at Word Art Wednesday. I want to share this verse with you in Luke 1:37 which says, "For no word from God will ever fail." God bless, always!